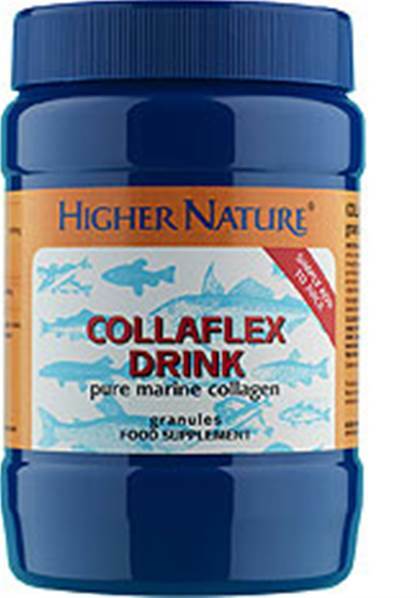 Higher Nature Super Strength Collagen Drink - pure marine Collagen - support for cartilage, joints, tendons & ligaments. Dissolves easily in juice. Sourced from fish. Hydrolysed collagen (from fish [including tilapia, Pangasus and Ictaluridae]). One scoop typically provides 6100mg hydrolysed Collagen (marine, non-shark) providing hydroxyproline and hydroxylysine in combination with other amino acids to a 90% minimum protein content. Suggested intake: Each full level scoop contains approximately 6g and so each pot contains roughly 30 servings. Corn-free, Soya-free, Wheat-free, Gluten-free, Yeast-free, Dairy-free, Sugar-free.